GEORGE WASHINGTON. 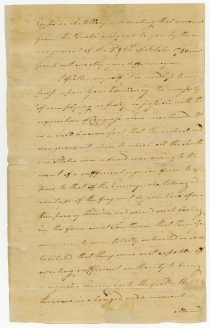 Circular Letter Signed, to Benjamin Harrison, December 19, 1781, Philadelphia. 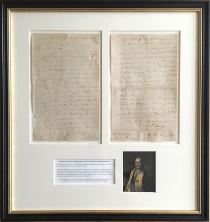 Text in the hand of Tench Tilghman, with two edits by Washington. 4 pp., 8 x 13 in. 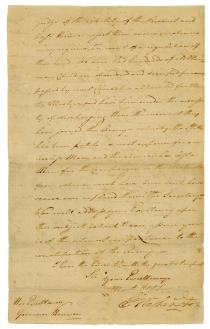 You will have been furnished by His Excellency the President with the Resolves [in Washington’s hand: of Congress] of the 10th Instant, calling upon the several States to compleat their respective Quotas of Troops by the 1st of March next. In order to ascertain the difficiencies, I am directed to transmit to the Executives of the States, Returns, under particular discriptions, of the number of Men each has in service. The Troops of your State composing part of the Southern Army, it would occasion an immense loss of time were I first to call for the Returns and then transmit them back from hence or wherever I may happen to be. I have for that reason directed Major General Greene to furnish your Excellency with the state of your line and give you credit for any Men you may have serving in the Legionary Corps or Artillery—deducting that amount from the Quota assigned to you by the arrangement of the 3d & 21st of October 1780, will point out exactly your difficiency. I flatter myself it is needless to impress upon your Excellency the necessity of complying as fully as possible with the requisition of Congress above mentioned. 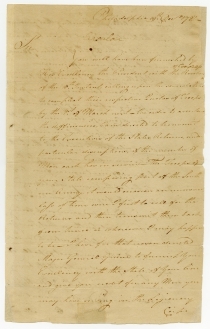 It is a well known fact that the critical and dangerous situation to which all the southern States were reduced, was owing to the want of a sufficient regular force to oppose to that of the Enemy, who, taking advantage of the frequent dissolutions of our temporary Armies, had gained such footing in the four most Southern States that their Governments were totally subverted or so debilitated, that they were not capable of exerting sufficient authority to bring a regular Army into the Field. Happily the Scene is changed, and a moment is allowed us to rectify our past errors, and, if rightly improved, to put ourselves in such a situation, that we need not be apprehensive of the force Great Britain has remaining upon the Continent, or which She can probably hereafter bring. But the greatest encouragement to a vigorous preparation is, that it will be the most likely method of gaining new Allies and forcing Great Britain into a negociation, which we have every reason to suppose would end in a peace honorable to the interests and views of America. I will take the liberty of recommending a matter to your Excellency which I must sollicit you to urge to the Legislature, as absolutely necessary to the filling your Regiments with proper Men, more especially if the mode of drafting should be adopted. It is, stationing Continental Officers of the Rank of Field Officers at least, at the different places of rendezvous, who shall judge of the Ability of the Recruit and pass Him or reject Him as circumstances may require. 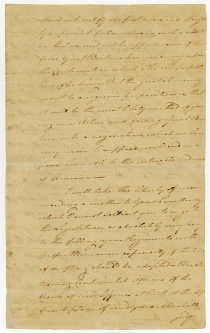 For want of a regulation of this kind we have had hundreds of old Men, mere Children, disordered and decrepid persons passed by civil Characters appointed for Muster Masters, and have been under the necessity of discharging them the moment they have joined the Army—whereby, the State has been put to a vast expence for an useless Man, and the Service has lost a Man for the Campaign, as the districts from whence such have been sent, have scarce ever replaced them. The Secretary at War will address your Excellency upon this subject, which I can assure you is of the utmost importance to the constitution of the Army. Congressional resolves urging the states to complete their troop quotas “in the most pressing manner” had been passed prior to Cornwallis’ October 19, 1781, surrender at the Battle of Yorktown. The American victory there marked the beginning of the end of the Revolutionary War. Washington, however, could not afford to be complacent; the enemy still held New York, Wilmington, Charleston, and Savannah. In a letter drafted two days earlier, Washington had acknowledged receipt of the resolves and written that he was “almost persuaded” that filling the ranks would make the next campaign “almost decisive.” He then struck the statement, evidently fearful that, even with the qualifiers, he was being overly optimistic. In his letter to the governors, however, Washington used that optimism to spur recruitment or, if necessary, conscription. Their previous failure to keep a sufficient force of regular troops in the field had allowed the enemy to virtually overrun the southern states. Now, with the victory at Yorktown, the tide had changed. Fielding a powerful force would likely force Britain into peace negotiations, with America’s having the upper hand. It worked. Britain abandoned the offensive war and accelerated diplomatic efforts. In the spring of 1782, the British opened formal negotiations with American commissioners. That summer, British troops evacuated Savannah, and a skirmish in South Carolina, the Battle of Combahee River, marked the last fighting between British and American forces. In November, Britain agreed to recognize American independence and to withdraw its forces. The Treaty of Paris was ratified by Congress on April 11, 1783. By the end of the year, the last British troops had evacuated New York City. Benjamin Harrison (1726-1791) was a graduate of the College of William and Mary and signer of the Declaration of Independence. Harrison served as governor of Virginia from December 1, 1781 until 1784. Four years later, he was elected as a delegate to the state convention for the ratification of the Federal Constitution. Harrison was the father of President William Henry Harrison and great-grandfather of President Benjamin Harrison.